The display, located on the main Daf stand, will focus on the latest model-year high horsepower XFs, including two limited edition 90th anniversary editions. The first, supplied by Stoke-on-Trent haulier D&A Rhead, will be a metallic black FTG 6×2 Super Space Cab, numbered 44. This will be joined by a second 90th anniversary XF from ABH Mansfield. “This will be cloaked in secrecy as to what this will look like. It will be finished just ahead of the show. A real showpiece for us,” said Imperial Commercials’ group marketing manager for trucks Jessica Smith. 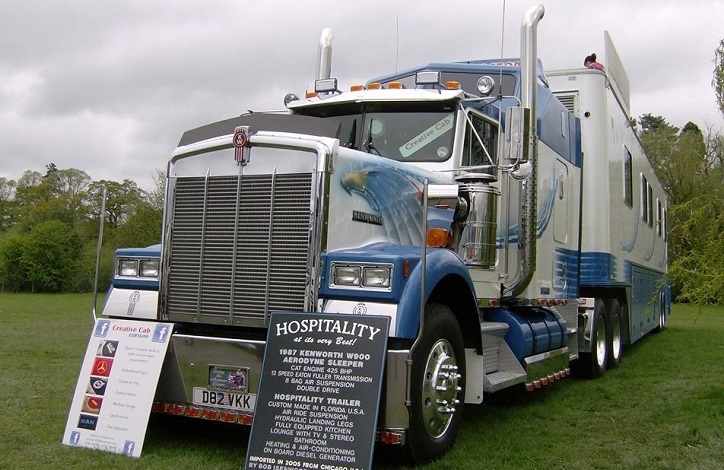 Stoke-on-Trent haulier Barry Proctor will also have a three-truck presence at the show: two airbrushed Space Monkey and Man of Steel XFs, as well as a head-turning Kenworth (pictured), which Smith describes as “a real crowd-puller”. Imperial’s commercial director Alan Ellison said he is excited to see what this year at Convoy in the Park brings, following a successful debut event last year at Donington Park. “The truck racing was a strong draw for people too,” added Smith. One of Imperial’s customers, Hexagon Leasing, will be taking part in the truck racing this year by leading the contenders on a warm-up lap in their brand-new XF. The dealership will also be using the event to help raise funds for its chosen charity Hearing Dogs for the Deaf.